The Golden Horn is one of the most beautiful beaches of the Mediterranean. It can be often found on the list of Top 10 best beaches in the world on the various websites and magazines. 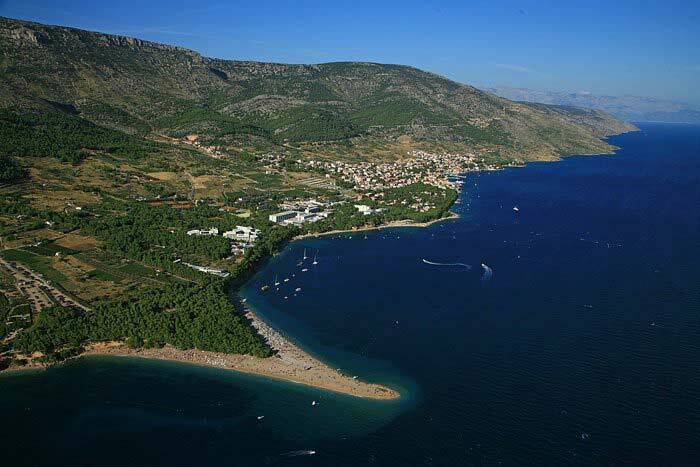 It is situated on the southern coast of the Island of Brac just 2 km from a beautiful town of Bol. Its elegance and allure have made it the symbol of both the island and coastal Croatia. It has a unique shape, like a tongue that stretches into the sea. This breathtaking golden pebble beach is 500 meters long and it is known as the “Zlatni Rat” beach. The water is clear blue. Usually, it is windy on one side and no wind on the other side with calm water, so you can choose what you prefer. The curiosity about this beach is that it changes its shape and position, depending on the wind, tide and the current. The pine tree grove which borders the beach is home to the remnants of a Roman villa rustica, which included a swimming pool. There is also a small part of the beach reserved for nudists. It is protected by the government of Croatia as geomorphological monument. It has a perfect position for various sport activities like windsurfing and kitesurfing and many international races and the world cup are organized here during the summer. Strong wind called ‘Maestral” gives windsurfers the adrenaline they need. In the summer days strong Maestral wind appears almost every day so you can imagine why Bol is called a windsurfing paradise. Zlatni Rat also offers a lot of other interesting things to do like beach volley, parachute rides, jet ski, banana rides, restaurants, bars, town on the sea for kids etc. Lets say it is a perfect place to go if you are young, active and want to have a good time doing some sports, for families with children and everyone who wants to enjoy the beauty of this amazing place.